The best of East Hawaii, Hilo vacation rental on Honolii Beach Road. Our Hilo rental is Quiet, clean and comfortable. This Hilo vacation condo is across the street from Honolii Beach Park (best surfing beach in East Hawaii and beautiful black sand beach).This open, breezy and spacious oceanfront Hilo vacation condo is the ideal vacation spot! The vacation rental can sleep up to three guests comfortably and it features one bedroom and one bathroom. Our comfortable Hilo vacation apartment is beautifully decorated and features a spacious living room, a fully equipped kitchen and an over-sized oceanfront observation deck that affords spectacular views of ocean and island. This Hilo ohana is the perfect way to spend the ideal vacation or just a quick getaway. The Big Island vacation rental boasts high-speed Internet and cable TV. Washer, dryer and BBQ grill are available. While spending time in our Hilo vacation condo you can also enjoy such water activities as surfing, swimming, beach road walks and shelling. Golfing, and biking also await outdoor enthusiasts in our Hilo accommodation. Our Hilo ohana has everything you need to feel right at home and our destination has just about every activity you could ever want to try with friends and loved ones. So do not wait any longer shoot us an email or a call, we will be happy to accommodate you in this Hilo vacation rental. This is an ohana studio attached but separate from our home. It does not have an ocean view. Unit is clean and modern with cable modem internet access and cable TV. 3 minute walk to Honolii Black Sand beach. This beach is the best surfing beach in Hilo and has a great beach for relaxing, swimming, reading and sunbathing. Guests are able to use the lanai and observation deck and barbecue. The rental is located on a quiet street where guests can take walks for 20 minutes. The rental unit is on the mauka (Mountain) side of the house and does not have an ocean view. 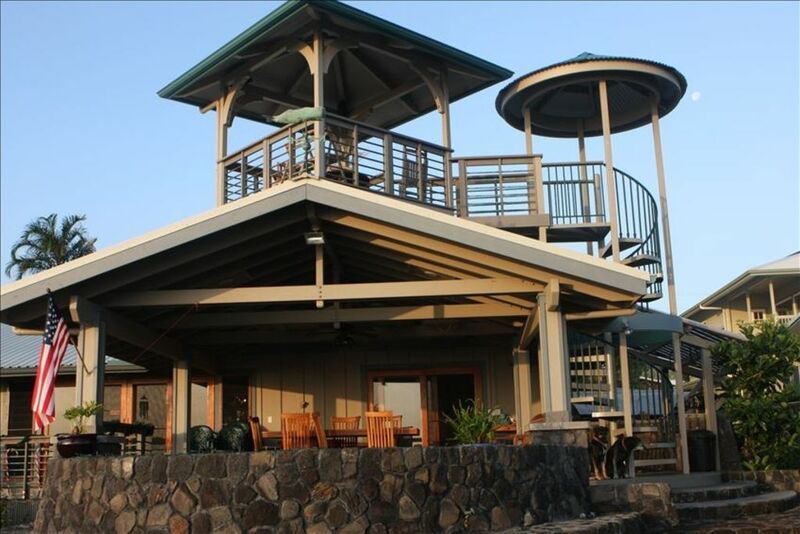 Guests have full use of the main house lanai and observation deck and barbecue. Small refrigerator; if more space is needed, may use owner's 2nd refrigerator. From the warm greeting and first look at the accommodations my husband and I felt at home. We loved sitting in the cupola and watching the surfers. The main attractions in Hilo were all a short drive away. Marie was a kind and generous host making sure we had everything we needed. Highly recommend this beautiful home away from home! The property is very close to a popular surfing beach and is quite comfortable. Marie is very friendly and a good host. One piece of advice for first time travelers to East Hawaii is to bring earplugs as the coqui frogs can be pretty loud and annoying at night. My Wife and I spent most of a week in Hilo to visit our daughter at the University, and could not have asked for a better arrangement. Unfortunately we did not meet our hosts, Marie and Greg, since they were likewise travelling, but they made every effort to make sure that we were comfortable and well accommodated. We did spend a few days in crowded Kona, but we were very glad to spend the bulk of our trip in Hilo and our stay on the eastern coast. We concluded that the Hamakua Coast is our favorite part of the island, and definitely the most beautiful. Their place is literally across the street from the coast and a very short walk down to the beach. We were still living on mainland time, so getting up at sunrise was no problem, and it was delightful to watch the sunrise and watch the surfers arrive for their morning surf . Their are a couple of wonderful walks right from the house, but with the terrace on the east side of the house a few steps away, and the viewing gazebo up a winding flight of steps the sights are very accessible to enjoy a start to the day, or conclude with a BBQ dinner on the terrace. The accommodations are quiet since there is a bit of distance to the highway, but if you read enough reviews you will know that the "coquis" are chirping wherever you go. I found it pleasant, but take earplugs if don't like the sound of nature. We also loved the cats and pair of dogs who made us feel at home. All said and done we think this is a perfect place to explore the Hamakua coast and to get acquainted with Hilo. Kind host and well equipped room. Amazing crows nest. As other reviews have noted, the room is great and the crows nest in the main property is amazing - we spent a lot of time there. Although we did not meet the hosts who were on holiday themselves, their house sitter took very good care of us. He was very helpful with advice and showing us everything. We were also touched by the graciousness of our hosts through things like remembering we were traveling with a baby and having a crib and toys in the room. Or the small gesture of leaving a note behind saying they were on holiday. They have 4 cats and 2 dogs outside on the property. They are all well behaved and sweet. We loved the view, outdoor kitchen option and close proximity to Hilo.